2020 Rally will be in Invercargill around the same time as the Burt Munro Challange in early February. If you've never been to 'The Burt' then it is a great weekend of racing, events and activities. There are a bunch of Australians coming over again who will be bringing their Harley and Indian race bikes - look out for the OZ vs NZ hand shift racing duels. Once again there will be a group of us riding down and back over a few days, probably down one coast and back up the other picking up IORNZ members along the way. Plenty of stops for interesting things along the way. 2021 Rally is going to a part of the country IORNZ hasn't been to before which is New Plymouth. 2022 Rally sees us all back in the South Island - likely to be southern again, probably in Otago somewhere. IORNZ holds an annual rally early in the year, for its members or anyone who has an interest in Indian Motorcycles. These are popular events and are well patronised, many members base their restorations and project builds being finished in time for the Rally. The 2019 rally was part of Art Deco weekend in Napier in Hawkes Bay. This year we again had a pre rally ride that saw 6 of us taking a few days to ride around the East Cape that included rising at 5am to see the dawn of a new day from the East Cape lighthouse. There were over 45 members and 38 bikes in attendance for the weekend that also included a public display held in central Napier and our bikes being included in the Art Deco parade through town. 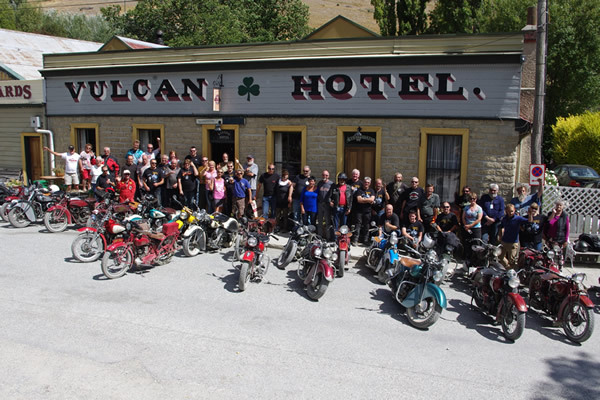 Our rally organisers had laid on a 200km ride around some of the great Hawkes Bay roads and an afternoon of socialising with the members of the Hawkes Bay Classic Motorcycle Club at their clubrooms. Check out the pictures from this and all our past rallies on the Photo Gallery page! In previous years it has been held at various places including Ngaruawahia, Cromwell, Whangarei and Haast. These are fantastic rallies organised by club members in the district. Come along and join a great bunch of friendly Indian guys and gals at the next one. These are fun events full of Indian motorcycle activities - COME ALONG.